This is an unofficial Union RailRoad railfan page. This page has no affiliation with Union Railroad. 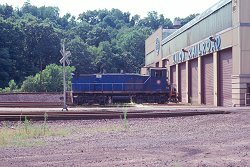 URR motive power as of early summer 2000 was solely EMD switchers. 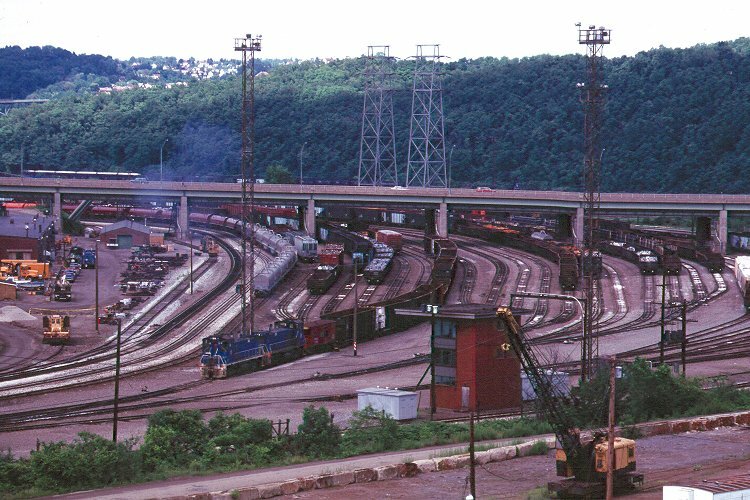 Number 29 leads a 4-unit set of light power and caboose across Grant Ave, on their way from the W&LE interchange at West Mifflin Yard to the Classification Yard at Duquesne. 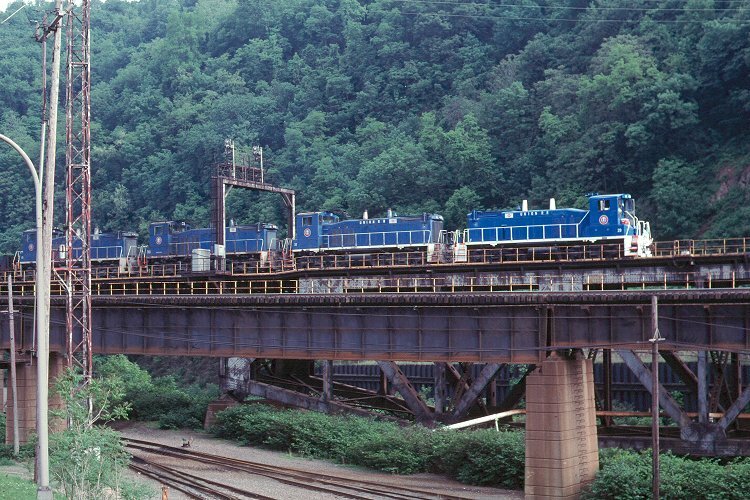 All URR trains use cabooses. 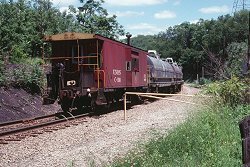 The caboose allows trains to run in either direction, using the caboose crew to watch signals when backing up. 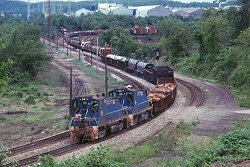 Due to the complicated trackwork and the relatively short distances, this adds a lot of flexibility to the operations. This caboose was leading a train from Irwin Works to West Mifflin Yard. 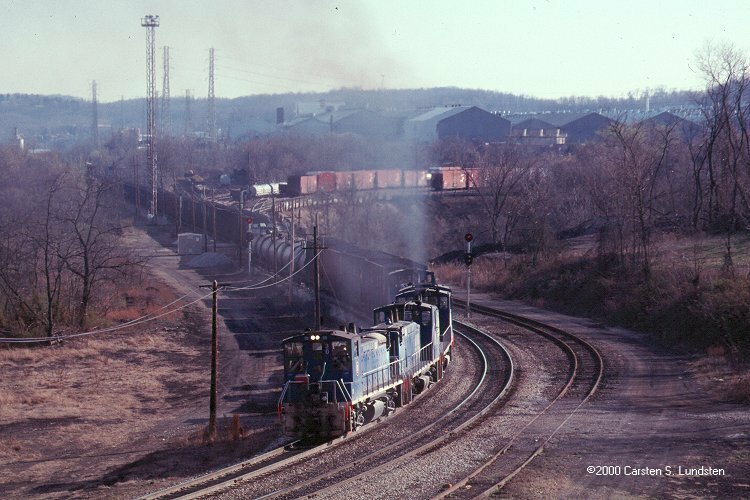 The train ran locomotives first to Bulls Run junction, then backed to West Mifflin Yard. Photo at Henrys Ln. 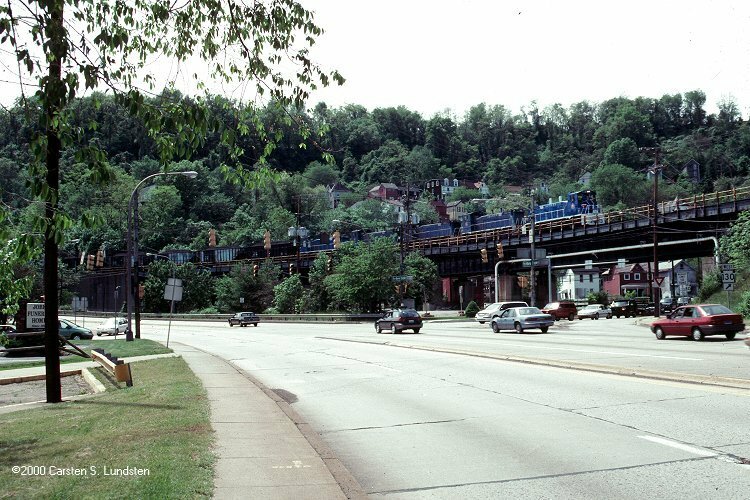 The above train is now on its way back from West Mifflin Yard, towards the Classification Yard. The train has just passed underneath the runway of Allgheny County Municipal Airport. My URR railfanning has unfortunately never had any great luck on good lighting conditions and this picture is no exception... Photo taken at Lebanon Rd. 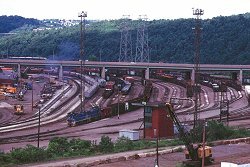 The Classification Yard is located in Duquesne. 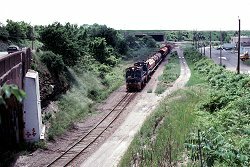 That area mostly resembles a modelrailroad that is too heavily loaded with tracks. Well - the reason is the same: Too little available room for the necessary tracks! The Classification Yard takes a 90 degr. 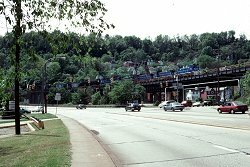 turn to the left after the road bridge (Duquesne Blvd), then heads down along the Monongahela River. Another piece of complicated trackwork is across the Mon River from Duquesne, at Port Perry. Here, in the back yard of US Steel's Edgar Thomson Works, the URR has several junctions and yards. 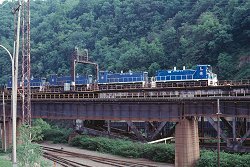 The train pulls up from the Dexter (CSX interchange) Yard with mostly empty coil cars for Irvin Works. The train then backs all the way to Irvin Works. Photo from the beautiful George Westinghouse Bridge (US 30). 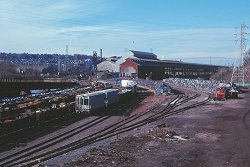 The above train entering Irvin Works. This is the rear of the train since the cars were shoved all the way from Port Perry. Photo from Circle Dr, which by the way still has a few trolley tracks left. 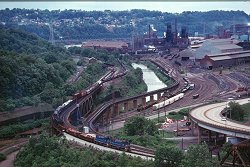 The perhaps most impressive train on the URR is the coke train, running from the Clairton Works to either the CSX interchange at Dexter or to ET Works. The train is very heavy and is almost down to walking speed when climbing the hill. This train makes even action at Tehachapi Loop seem fast! Back in the back yard of ET Works. 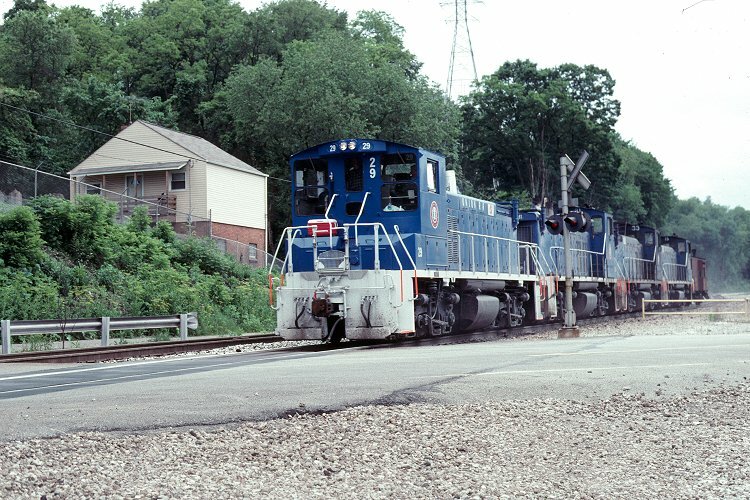 A URR switcher switches the yard. An out of service ET switcher is sitting next to the track without its trucks. Photo from Braddock Ave. 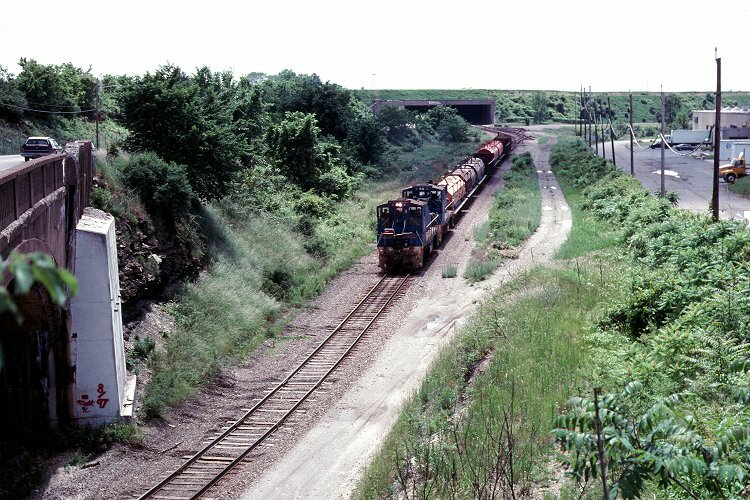 Same location, with a train on the elevated structure. From Port Perry the line runs north in the Turtle Creek Valley. The URR line runs as an elevated structure part of the way, until it joins Thomson Run. 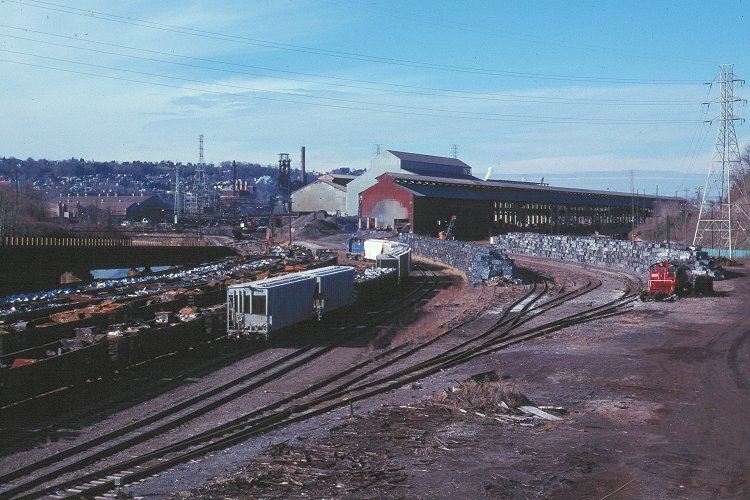 Coal train on the way to the Bessemer & Lake Erie interchange at North Bessemer Yard, Triboro Expy. 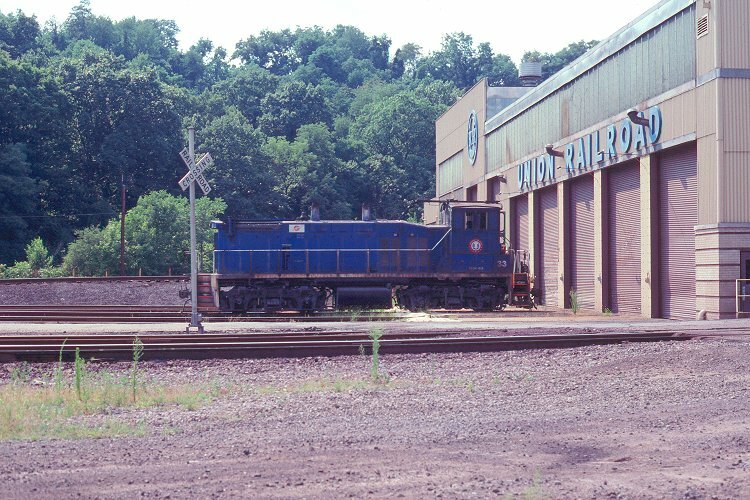 On the way to North Bessemer Yard is Hall, home of the URR shops. Engine 33 is sitting outside the shops. Photo from Thomson Run Rd.